The British government is insistent: Russian was responsible for the Salisbury poisonings. Even though it would gain nothing from the poisoning and no compelling evidence has yet been produced to substantiate those claims, the media and the government are adamant: Russia was responsible. 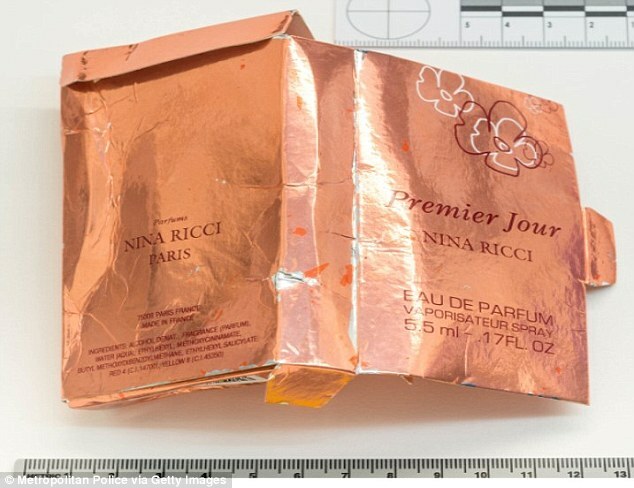 Yet all we have to prove Russia’s involvement is a fake perfume bottle (pictured right), which could have been manufactured anywhere. While the Novichok itself may not even have come from Russia. It could have just as easily been concocted at Porton Down, Britain’s main chemical weapons laboratory, which is very conveniently situated just ten miles or so from Salisbury. As with any crime it’s always valuable to ask: who would benefit? Russia would obviously gain nothing from poisoning the Skripals. However, there is trans-Atlantic clique that is growing in power and which sees Russia as an obstacle to its ambitions. In tandem with its allies in Israel and the gulf states, its plan to break-up Syria and Iraq, using Sunni militants as proxies had been frustrated by Russia’s intervention in the region. Were it not for Russia’s intervention in Syria in 2015, Assad would have been ousted and a new Sunni Caliphate would be emerging from the ruins of Syria and Iraq. Opening the way for the expansion of Greater Israel, and the seizure of Syrian and Iraqi oil fields by the Saudis and Western oil giants. Russian intervention put a stop to that plan and it may stay that way unless Putin is dealt with. Hence, I would suggest, that the Skripal’s poisoning was part of a wider scheme to demonise Russia and portray Putin as some sort of threat to the West. Just as Saddam Hussein was once. Already other western nations are lining up in support of British allegations against Russia over the Salisbury poisonings. Just as they did when the Bush administration lied about Saddam Hussein’s WMD. Too late we learned about that deception but now we appear to be on the brink of a similar process, this time with Russia. This may not lead to direct military conflict, at the moment that is all being done by proxies, but it may have a number of other outcomes, none of them pleasant. Apart from trying to contain Russia’s growing power we may see an attempt to oust Putin, using local political rivals covertly sponsored by the West. We are also likely to see more episodes like the Skripal’s poisoning: stage-managed events which are used to smear Putin. Readers will also note that we’ve heard little from the two central figures in this drama. From Yulia Skripal we’ve had one stilted press statement some months back while we’ve seen and heard absolutely nothing from her father, Sergei Skripal. Are they still alive? Are they being held under duress? We don’t know but Sergei Skripal’s absence is all the more troubling as prior to his poisoning he had reportedly expressed a desire to return to his native Russia. Had he done so he wouldn’t have just delivered a propaganda blow against Britain and the West. Sergei Skripal could have provided Putin’s intelligence services with vital insider information on the West’s broader global designs. Did British security decide that Sergei Skripal had become a liability? Is this why we’ve seen and heard absolutely nothing from him? Has he been silenced, permanently, not by Russia but by British intelligence? Whatever Sergei Skripal’s fate, expect to see more attempts to smear Russia in the coming months. Ed. 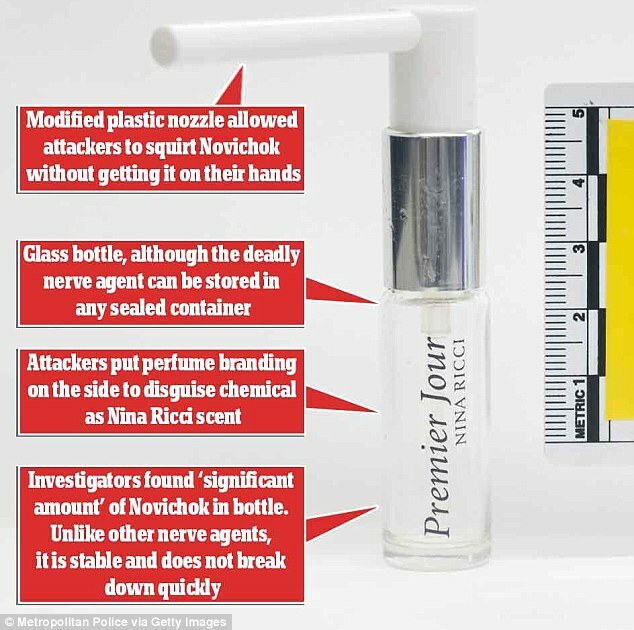 The Russians spent a fortune on the tiny James Bond-inspired perfume bottle used to carry novichok including developing new technology to ensure it wasn’t a suicide mission for their agents, experts revealed today. Hamish de Bretton-Gordon, one of Britain’s top chemical weapons experts, says the fake sample vial of Nina Ricci Premier Jour could only have been produced by Putin’s top scientists in their most sophisticated and top-secret lab. He told MailOnline: ‘They needed to ensure that the men carrying out the attack did not kill themselves while doing it. It would be deeply embarrassing if their agents died on foreign soil’. The two assassins, using the aliases Ruslan Boshirov and Alexander Petrov, carried the bottle of Novichok into the UK unhindered before spraying it on Sergei Skripal’s front door in suburban Salisbury in March. The lab, branded ‘Q-ski’ after the research and development division of the British Secret Service in James Bond, made the bottle and ‘one-way’ applicator nozzle so it was impossible for novichok to leak out in transit. It was also made of specially toughened glass, plastic or ceramic sure not to smash, crack or degrade while carrying one of the world deadliest weapons.